There is a park in México City called “De los Espejos” (Park of the Mirrors). Many dreams of mine were formed there which later shaped my present life style. This beautiful park is in the fashionable Polanco, near Reforma Avenue and Maximilian’s Castle. It has many trees, an outdoors auditorium, a large aviary, a skating ring and two large “U” shaped ponds for model boating. Ever since my I was a little boy I have been visiting this park. My father would take me there sometimes. It was there where I first saw a remote control toy boat, a wonderful reproduction of the then famous “Queen Elizabeth”. It went all around the pond wherever her captain would command from land. When the sun fell, suddenly its lights went on! All this little rows of port holes shone reflecting on the still waters. It was quite magical, and I dreamed with someday having a toy like that. Many years went by and then, with three sons of my own, I World take them to play at the park. We often took model boat to the ponds. Some were remote controlled and others only sail –the later were much fun, since so many unexpected adventures could happen to them with the sudden wind changes: we might have to run to the other side of the pond to avoid a disastrous crash, other times we would return wondering where it would end up going…or it may even stay in the middle without wind. Other boat hobbyists would come and regattas would take place. From the park benches we would witness marine scenes and dream. I built a couple of models from scratch -no prefab kits. One of them was a large motor yacht for Santiago and a beautiful sloop for Alvaro; all hand-made. They sailed well. Adding up the boats we bought to those we built we came to own a fleet-full of memories. This was our routine for many Saturday: take the boats to the park, along with bicycles, eat pizzas, then ice-creams…spend the afternoon. Many conversations took place while we looked at the toys sailing. Even then I was proposing to leave Mexico City, which was turning violent and polluted, for a quieter place, preferably by the sea. Still more years went by and one day my oldest son, a man now, came from Mexico City and brought me what was at a time our best sailing sloop in our fleet. 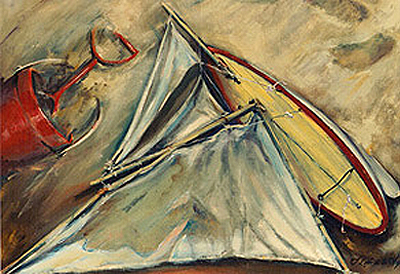 Now I see it here, with its broken mast, its sails now stained antique, the enamel on the hull carrying the scars brought by hitting the edge of the pond when we could not run fast enough to match it. This little sloop may still be repaired- I promise to get around to it one of these days. Yet, repaired or not, it stands as a symbol of a defining past. Now living in Nuevo Vallarta, I see many real boats, I get invited by friends and clients to ride on many, and I have even come to own one. I have taken part in the local regattas and occasionally I still enjoy sailing, although I must say that the sun and the salty wind now wear me out some. Looking at the old toy sailboat my sons and I sailed so many Saturdays at the park, I think it was probably there where the wish to come and live where I now do and be happy as you can reasonably expect to be in this life. Still, I admit my heart is flooded with nostalgia for times past. I can remember everything: the arrival to the park, waiting to cross the street, each of us holding a hull in our arms. I touch this little sailboat and if I close my eyes I can still heat three boys yelling. Now that they are far…How I wish I could hug them and lift them all at once! could, then. The Photo accompanying this article is of the portrait of the toy boat. It’s an oil on canvas 50 x 80cm, owned at present by my son Alvaro. I hope the will inspire to compose some of his music, perhaps an ocean symphony.